Users are having a hard time finding people to run with them. Not just anyone—runners who were at the same running level and skill as them. There was the problem of scheduling time with one another, with users being busy with work, school, or both. This project was an idea prior to user research and was validated with research findings. Add a new feature allowing new and existing users to connect with other users within the Nike+ Run Club community and find their perfect running partner. Create a method for users to communicate their work and school schedules together and find the time to run with one another. Think Nike meets Tinder, used as a tool for users to find people to run with, minus the dating aspect (that's another story). While conducting secondary research, focusing on who, what, when, where, why and how questions served as a mental framework. These questions helped evaluate research unknowns and test assumptions. Why do we need running partners? When we run together, we hold each other more accountable and run more consistently. How do we find our sole mates? Define your level and your goals. Who is Nike's market audience? Women in their 20s and 30s are largely driving the "athleisure trend," in which customers buy leggings with the intent of wearing them to the gym, errands, and brunch. Nike gets young athletes to wear its products through sponsorships with local leagues, clubs, and federations. New running shoes include the LunarTempo, which is designed for distance runners. Nike is also innovating running apparel to better compete with Lululemon, Under Armour, and Adidas. After collecting secondary research findings, the data was validated by conducting 1:1 interviews with real world users. Nike Retail Store, South Coast Plaza, Costa Mesa, California. I visited Nike retail stores located in Southern California to interview employees who used the app. I also reached out to family and friends (of friends) who referred me to other NRC+ app users. Most of these participants were both undergraduate and graduate students and had part-time jobs. All were millennials. Putting together an empathy map helped find common themes and pinpoint essential user insights and needs. The data collected from user contextual inquiries was then analyzed to create a user persona. This persona acted as a fundamental reference and helped brainstorm solutions based on user needs. Listening to audio recorded notes from user interviews translated the insights and needs into common pains and frustrations found throughout research findings. After research I moved into designing and building the experience. Information architecture, interaction design, and wireframes each progressed in two week sprints. Below is the app map and user flow diagram created. This helped mentally visualize how participants would interact with the prototype before building out mid-fidelity wireframes. In this app map and user flow hybrid, the new feature was added under Nike's existing "Community" category found below "Club" screen. It is a feature implied to help new and existing runners connect with others within the Nike community. User response and feedback was obtained while observing participants play with the prototype. 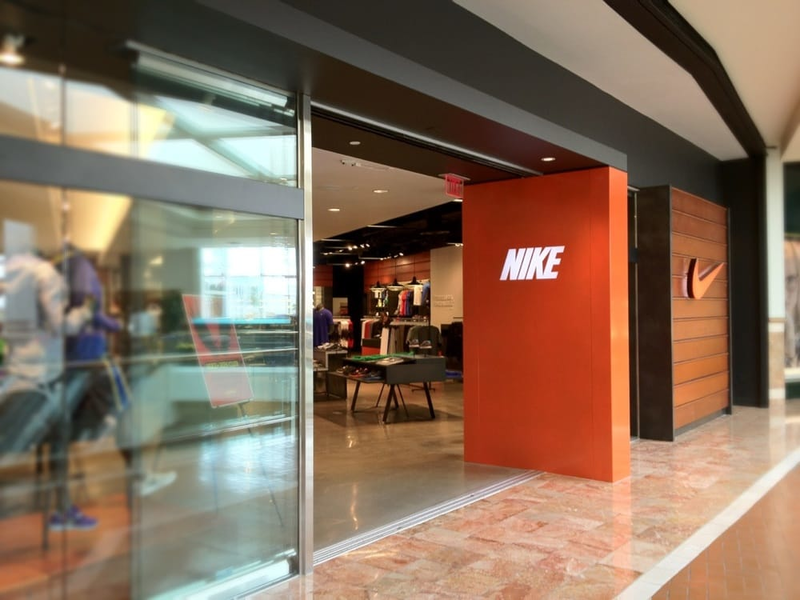 A usability testing plan was created and implemented by finding users at a Nike retail store (South Coast Plaza) and also by reaching out to past participants from initial research findings. 1. User will build out a partner plan profile. 2. User will read partner plan instructions. 3. User will swipe right on Will’s partner profile. 4. User will end on the conversations screen. After receiving user testing feedback, an affinity map analyzed overall successes, patterns, and comments based on the user prototype experiences. This helped create new design recommendations and apply them to final high-fidelity wireframes shown below. The solution to the problem starts out with a "Partner Plan Setup" which allows users to fill out a partner plan quiz assessment. Users answer curated, personalized questions to help find the best partner profile matches available for them. Once the partner plan is built, users will have access to their partner profile matches. Users can browse partner profiles by swiping down, depicted on the upper right carousel. The carousel contains user profile image uploads and a partner profile card. 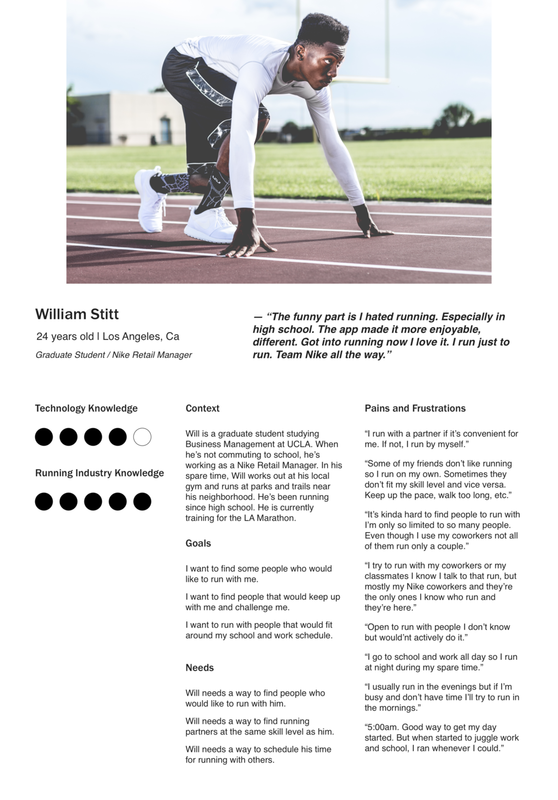 The partner profile cards contain personal running information, allowing users to choose who they want to run with based on their running levels, skills, and stats. When users swipe left to "Skip", the interaction leads the user to another partner profile, allowing them to choose who they wish to run with. Users can swipe right to "Connect". Once both runners swiped right, they have access to communicate with one another via conversations. This allows them to plan a run together based on their schedules around work and school. Users have the ability to adjust their running schedules after building out their partner plan. This feature was added because it gives users full control to their running schedule settings. This is viewable to other runners as well when browsing partner profile cards. Users can also modify partner plan settings found under "Partner Plan Preferences". This allows users to adjust filters such as physical location (distance), age, gender, running milage, etc. based on their personal running preferences. Runners either wanted to be motivated by their running partner or be the motivator. This demonstrated a symbiosis relationship in the form of mutualism, as there were shared benefits for both parties. A glimpse into the future of personalization. Users each have their own goals and needs based on their mental outlook and physical aspirations. A strong, uplifting energy and upbeat environment within the Nike community. There was respect for each and every person, no matter where they were at in their running journey.